When I think of 7-Elevens in Canada, a few different images rise up in my mind. A grubby shop with over-priced chocolate bars, Wonder Bread, a large drinks cooler with glass doors, a few Slurpee machines, and a magazine rack. A decade or 15 years ago, you might have seen a few video games stuck in the corner. Funny, "video game" doesn't instantly paint the picture it used to. By video games, I mean the big stand-up ones in the cabinets that had the joysticks and buttons. Years ago when I was about 13, a friend and I spent an afternoon hammering nickels into the approximate size of quarters. Of course, the next step was to see if the slugs worked on video games and vending machines. A 7-Eleven down the road from where I lived had a couple of those video games and we spent one afternoon feeding those bashed nickels into the coin slots while furtively looking around to make sure that no one had caught on to our little scam. They worked like a charm. When the first bashed-smooth slug dropped in with a satisfyingly appropriate sound and triggered a credit on the machine, we looked at each other with sneering pride. Besides the most common goods on offer, most 7-Elevens in Canada at that time had a turbaned proprietor behind the counter and maybe one other employee working at any given time. Wait, that's not fair. The owner didn’t always have a turban although almost inevitably he was from the Indian subcontinent. It's impossible to make a blanket statement about the disposition of those enterprising individuals. Some of them were the nicest people you could meet while others were sullen or borderline hostile. And that's not really surprising. Because 7-Elevens in Canada are also known for a couple of other things. First, armed hold-ups. Open 24 hours a day, with cash on the premises, few employees present, and almost always well situated for a quick getaway by car, they are obvious targets. Second, they present a perfect location for young punks to loiter and raise havoc. Many 7-Elevens in Canada are stand-alone establishments, often located in the corner of a parking lot of a shopping mall. Plenty of parking spaces, with four walls to lean against, spray graffiti onto, and generally take over as a place to meet, plan mayhem, and load up on junk food and cigarettes. So, yes, owners and employees of 7-Elevens in Canada do put up with their fair share of crap. In short, Canadian 7-Eleven can be found in numerous locations throughout some of the country's biggest cities. It offers a convenient place to pick up overpriced junk-food, lottery tickets, and cigarettes. Walking into a 7-Eleven and conducting your transaction can often be a seedy, unpleasant experience during which you may come into contact with assorted scumbags purchasing goods or casing the joint with the intention of pulling off an armed robbery at a later time. The 7-Eleven experience in Thailand is vastly different. 7-Elevens in Thailand are ubiquitous to the point of absurdity. Near my current home in Bangkok, there are seven 7-Elevens within walking distance. I once worked at a university in Thailand that had no fewer than 10 7-Elevens on its campus. Yes, 10. This is not an exaggeration. Ten individual 7-Eleven stores on the same university campus. There might not be that many in an entire medium-sized city in Canada. Most 7-Elevens in Thailand are not of the stand-alone variety though there are many of those as well. Most of are located on the ground floor of large office buildings or in long one, two, or three-storey shop-houses. Many of them are tiny: one that I occasionally frequent does not have enough space for more than four people to stand inside at the same time without being cramped. Others are extremely large and have their own pharmacies and post offices and 20 or more staff working in them at a time. Thai 7-Elevens offer many products and services. I can top up my mobile phone at any 7-Eleven. I simply tell the clerk which service I want and for what amount and then I type in my number into a small terminal, pay the fee and within seconds the transaction is complete. Similarly, I can pay all my household bills, such as internet and electricity, at any 7-Eleven. I can pay for airline tickets for one of the largest internal airline companies in Thailand. I make the booking online, take a booking number to my local 7-Eleven, and with a small fee included (about the equivalent of 80 cents), pay for the ticket. I'm then provided with a printout that suffices for checking in at the airport. The usual products are available: a wide range of salted snacks including many US brand potato chips, chocolate bars, cakes, bread, canned goods, milk, cold drinks, and ice cream. Unlike in Canada, where alcohol can only be bought in government-run liquor stores or authorized beer vendors, 7-Elevens in Thailand offer a wide range of alcoholic beverages: beer and alco-pops in the fridges, and hard liquor behind the cashier—Thai and imported, with Smirnoff and Baccardi the most popular foreign brands—and wine (Jacob's Creek seems quite popular). The iconic Slurpees and Big Gulps are there too. Pre-packaged sandwiches and other 7-Eleven-brand food provide a consistent and surprisingly good-tasting choice for when you are strapped for time or don't want to risk having your guts shredded at a local restaurant. The croissant ham and cheese sandwiches are a personal favourite, and new entries in recent months have included the pizza croissant sandwich and the sausage and cheese sandwich (in reality, "hot dog" better describes what Thais consider sausages). Speaking of hot dogs, you can get a reasonably good one at 7-Eleven, though you should take a close look at the ones on display on those heated rollers before ordering. Better to get them to nuke a fresh one and then put it in a preheated bun. Update: unfortunately, hotdog buns are no longer available at 7-Elevens in Thailand, likely due to the fact that most Thais prefer their hot dogs sliced into small pieces and placed in a bag, from which they can skewer each piece with a sharpened wooden stick. Other options in the packaged but perishable range include fried chicken, sushi and pork burgers. Many of these I don’t buy, but turnover is such that you can usually find something reasonably fresh or at least with an expiry date that is still a few days away. A related line of food is the frozen range, again 7-Eleven brand and with many varieties. The best thing about these meals is that you know you will get the same thing every time. The taste ranges from surprisingly good to bland, with portion sizes somewhat disappointing on occasion. Many 7-Elevens now have their own little coffee bars that provide reasonably priced, freshly brewed cups. Some of the bigger locations also have their own line of pastries (usually baked elsewhere and trucked in, though some now have their own small bakeries onsite) that are available self-serve style with a pair of tongs and a tray. The price (often the cheapest available for numerous items), locations (i.e., everywhere), selection, relative freshness and consistency make 7-Elevens quite appealing for the expat in Thailand. They are always a good place to break a 1000-baht note as well. I often slip in and buy a 12-baht KitKat just so that I can get a fistful of hundred-baht notes. A 7-Eleven clerk will never balk at this. The entire chain probably pulls in a couple million baht a day just on the small purchases made by people who want to break 1000-baht notes. Besides all those benefits, there are other reasons for heading down to the local 7-Eleven. It's a nice air-conditioned respite from the brutal heat of the midday sun in Bangkok. And once you are in there, you will not be slyly watched by employees. At a good-sized 7-Eleven, there could be as many as 20 employees wandering around. Add in a dozen or more security cameras, and you really are free to wander unmolested. But more than that, there is simply a pleasant disconnect that you are afforded by employees at 7-Elevens in Thailand. In fact, I often spend a good 10 or 15 minutes pacing up and down the aisles at the local branch. I may not have even purchased something. I've been a pacer for many years. It's kind of like an active form of meditation. I've never been bothered or even given a second look while doing this at a 7-Eleven in Thailand. You would be physically thrown out, or a staff member might even call the police to intervene if you tried this in Canada. OK, to be fair, I generally engage in my pacing routine at 7-Elevens where I am already known. But I have on occasion chanced on a previously unknown 7-Eleven in Thailand and just had a good relaxing pace for 10 minutes or so before leaving. Once in a rare while I stop and start juggling three or four dry-food items for kicks. But probably the best aspect of 7-Elevens in Thailand is the people who work there. They are extremely friendly and are perfect for practicing your Thai with. Many young female university students work part-time at 7-Eleven and they are always willing to speak Thai with a foreigner. Even after I have finished paying for my items, I will often linger around the front counter and discuss various topics with the staff. This love letter to 7-Elevens in Thailand likely won't sit well with those wanting to go native. It just doesn't seem right to praise a western franchise in a developing country, especially one that, to date, has more than 8000 locations in Thailand, half of them in Bangkok. But after more than a decade in Thailand, I don't give a good freak-damn whether other foreigners deem my opinions on my adopted country appropriate or not. Sure, there are plenty of enjoyable, non-corporate, traditional experiences to be had, but more often than not, I'll stride by the street restaurant pitched up outside a major 7-Eleven and carry on into the air-conditioned comfort where I can have an ice-cold drink, pace the aisles for 10 minutes and then have an impromptu Thai lesson with the staff. 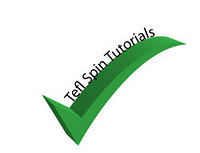 This tutorial demonstrates how to move a table within a Microsoft Word 2007 document (these instructions likely work in later versions of MS Word as well). These instructions are for computers with Windows operating systems. Note: To more precisely move a table, after you begin moving the table, press and hold the Shift button on your keyboard. If you began moving your table horizontally, holding the Shift button will lock the movement to the same horizontal plane. If you began moving your table vertically, holding the Shift button will lock the movement to the same vertical plane. In 1960, John Steinbeck set off in his modified pickup truck with his poodle, Charley, and spent the next two and a half months travelling across America. The journey occurred in the twilight of Steinbeck's life, and appropriately, he departed just after summer had rolled away to die. His ostensible reason for making the trip was to rediscover something about America, its people, and its character. In Travels with Charley: In Search of America, Steinbeck chronicles his journey. I've read a number of Steinbeck's classic novels over the years and felt certain that his talents as a memoirist would be just as rewarding. I wasn't disappointed. A kind of double appeal existed when picking up the book—no doubt Steinbeck's spare, concise writing style would be in evidence, but I also felt a voyeuristic attraction in reading about the exploits of one of America's most successful novelists of the 20th century as he wandered the highways and back roads searching for interesting stories to tell. But Steinbeck wisely decided to remain as anonymous as possible during his months on the road. It's impossible to avoid making any references to oneself when writing a memoir, but he at least removed an angle that could have resulted in some fawning and disingenuous interactions with people he met along the way. During the previous winter I had become rather seriously ill with one of those carefully named difficulties which are the whispers of approaching age. When I came out of it I received the usual lecture about slowing up, losing weight, limiting the cholesterol intake. This marks the beginning of one of many extended passages that are interspersed throughout the book and which focus on various subjects. In this particular passage, he goes on to discuss the fact that he does not want to become dependent on others as he gets older. Like most people who have lived to a reasonable age, Steinbeck had already acquired a lifetime of wisdom when he set out on his journey. But unlike most people, he was able to distill that wisdom into engaging and entertaining prose. As with many of his musings on the world and the ways of human beings, his piece about refusing to regress into an infantile state as old age looms, had me nodding in agreement. It would be his last lap around the country he loved so much and which provided him with the inspiration for the books he wrote. And yet, he never seems quite at ease with what he finds, and he regularly questions the direction in which he sees society heading. He is never bitter, only philosophical, and the tone often reminds me of a theme that is so common in many old western movies. Everyone reaches a stage in life when the world has moved on, and the only thing left to do is settle accounts and say goodbye. Those tales usually strike a chord with anyone who has ever yearned for something better, learned about loss, or faced down their own mortality. Like those movies, Steinbeck's words are often graceful and poetic as they simultaneously celebrate and lament the human condition. The nostalgia that comes through in a book written more than 50 years ago is palpably different than in one whose author looks back in time and tries to recapture the past. A certain turn of phrase that no longer exists, the world frozen at that particular place and time, and the knowledge that the author too has long since passed away, all add a special kind of wistfulness to the reading experience. Also, with the intervening years, you can judge just how prescient Steinbeck was with his analyses and predictions. Indeed, he was very accurate in much of what he wrote. Of course, it was hardly rocket science to foresee that cities would keep growing, the local flavour of many regions would start to disappear, and the reckless, predatory approach to the environment would take its toll. It is possible, even probable, to be told a truth about a place, to accept it, to know it and at the same time not know anything about it. I'd never been to Wisconsin, but all my life I had heard about it, had eaten its cheeses, some of them as good as any in the world. And I must have seen pictures.Everyone must have. Why then was I unprepared for the beauty of this region, for its variety of field and hill, forest, lake? ...I don't know how it is in other seasons, the summers may reek and rock with the heat, the winters may groan with dismal cold, but when I saw it for the first and only time in early October, the air was rich with butter-colored sunlight, not fuzzy but crisp and clear, so that every frost-gay tree was set off, the rising hills were not compounded, but alone and separate. I could hear them say, "You mean you were that near to Yellowstone and didn't go? You must be crazy." Again it might have been the American tendency in travel. One goes, not so much to see, but to tell afterwards. I felt the rage and hatred one has toward non-appreciators, toward those who through ignorance destroy a treasured plan. Now, in the above sentence, Steinbeck is referring to his dog Charley not appreciating the majestic splendour of a redwood tree, but still, the sentiment is a good one. And speaking of Charley; as the only other main character in the book besides Steinbeck, he gets a fair amount of ink. Steinbeck clearly loves his dog and any pet lover will enjoy those comments about his furry travel companion. Presently I saw a man leaning on a two-strand barbed-wired fence, the wires fixed not to posts but to crooked tree limbs stuck in the ground. The man wore a dark hat, and jeans and long jacket washed palest blue with lighter places at knees and elbows. His pale eyes were frosted with sun glare and his lips scaly as snakeskin. ...I pulled up to speak to him, saw his eyes wash over Rocinante, sweep up the details, and then retire into their sockets. And I found I had nothing to say to him. All books, not just novels, thrive on conflict and drama, and there are many pages that will keep readers following along in excited anticipation. The direction of Steinbeck's trip meant that he visited the South just before he returned home (or maybe he had an inkling that events in that part of the country might provide some good drama and planned his journey with that in mind). Regardless, the descriptions of racial tensions in New Orleans and other locations, and the deft character sketches of people he meets in the South provide some of the most compelling reading in the book. For the most part, Steinbeck makes the racists he encounters look like scared buffoons, though he also meets a number of people sickened by the civil rights' abuses that were going on in their midst at the time. Travels with Charley has enjoyed a resurgence in popularity recently, somewhat in part because of questions regarding the authenticity of both the timeline involved and Steinbeck's interactions with various people along the way. This writer (a former journalist) in particular has devoted a lot of time to researching Steinbeck's book with the goal of demonstrating that things just couldn't have happened exactly the way Steinbeck claimed they did. Some of the information on his website is interesting (and he has written a book about his research), but the whole underlying premise of trying to prove that Steinbeck took liberties, created some composite characters and even cooked up some dialogue, just seems rather pointless. Although I suppose piggy-backing a book on the legacy of one of the most famous writers of the past hundred years has potential for generating publicity. In my experience, all non-fiction writers play with the truth to varying degrees. Especially in travel writing, where an obvious narrative doesn't always present itself, I have often found myself wondering how things happened to fit so nicely in certain travel memoirs. Of course, readers expect that things happen basically how they are presented in non-fiction books. But most people would not be outraged to learn that the dialogue they read in a travelogue is not exactly how it was spoken. If writers presented conversations verbatim, they would be unreadable. 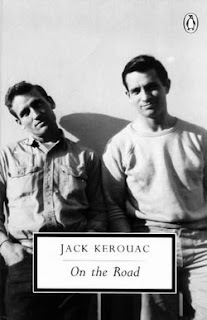 The idea, repeated by the writer linked to above, as well as others, including Steinbeck's son (who is on record with a few nasty digs at his deceased father—not sure what the story is there) that because Steinbeck was a novelist, it should be expected that he created large swaths of Travels with Charley out of whole cloth. I disagree. 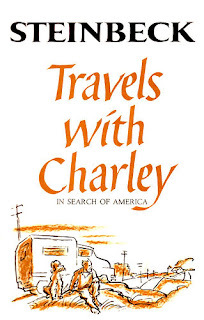 I think the only expectation is that whatever changes another writer would have inevitably made wouldn't have resulted in a book that was as well written or entertaining as Travels with Charley. No doubt some of the claims about authenticity go beyond manufactured dialogue. But if Steinbeck put in the time on the road, visited the places he says he visited, and maintained the spirit of conversations he had with the people he met, I don't have much problem with a few embellishments. However, after saying all that, I still feel there are some rather clichéd passages in Travels with Charley. For example, as Steinbeck sits in a hotel room vacated by another guest but not yet cleaned by hotel staff, he tries to imagine the recently departed guest based on the state of the room and some scraps of paper he left behind. It comes across as rather unbelievable. But then, life often is unbelievable. Wouldn't it be interesting if those sections of the book that seem to lack realism were in fact fully authentic, while others that attracted no scrutiny were invented? Yet, even though the hotel scene feels a bit forced, the stark loneliness of the passage combined with the prurient interest it elicits makes it effective and memorable on another level. Travels with Charley was released in 1962 and was Steinbeck's last major, original work published while he was still alive, and fittingly, it spent some time as the New York Times number one bestseller. More than fifty years later, Steinbeck's observations, wisdom and simple eloquence make Travels with Charley a book well worth reading.